New Office 365 capabilities this month include tools to improve the quality of your work, craft compelling resumes, and work with team members outside your organization. Office 365 administrators also benefit from new ways to manage collaboration at scale, communicate complex ideas, and protect their employee and customer data. Read on for details. We continue to build on intelligent technology in Office 365 with a new set of AI-powered features to improve the process of content creation. Improve your writing with Editor—The new Editor overview pane in Microsoft Word brings together a set of tools to optimize the process of editing and finishing your work. While you’re editing a document, Editor overview shows a summary of opportunities for enhancement with corrections, refinements, and stylistic suggestions that take into account the context of the overall document, allowing you to make changes linearly or by category. Additionally, for education subscribers, the Editor overview pane provides teachers with a dashboard to understand common errors individual students make and inform lesson plans. Editor overview is available to all Office 365 subscribers and replaces the traditional spell check pane. To get started, click the Check Document button in the Review tab of the ribbon. Editor shows a summary of opportunities for enhancement with suggested corrections, refinements, and stylistic changes within the context of the overall document. Craft compelling resumes in Microsoft Word—Last November, we announced Resume Assistant, a new AI feature in Microsoft Word to help you craft a compelling resume with personalized insights powered by LinkedIn. This month, Resume Assistant began rolling out to Office 365 consumer and commercial subscribers on Windows. With over 80 percent of resumes updated in Word, Resume Assistant helps job seekers showcase accomplishments, be more easily discovered by recruiters, and find their ideal job. To learn more about Resume Assistant, read the official LinkedIn blog or visit Office Support for tips, tricks, and information on how to get started. Resume Assistant helps you craft a compelling resume with intelligent, personalized insights powered by LinkedIn. Get to information faster with StaffHub Now—Updates to StaffHub provide new ways for Firstline Workers to manage their day. The new StaffHub Now tab includes a preview of your workday, with notes, activities, and breaks all in an easy-to-read format. We’re also making it easier to quickly access StaffHub by bringing it to the Office 365 App Launcher. StaffHub subscribers can navigate to Office.com and sign in with their work account to get started. Updates to Office 365 this month help administrators manage access to resources, better understand what information they have stored, and strengthen their compliance posture. 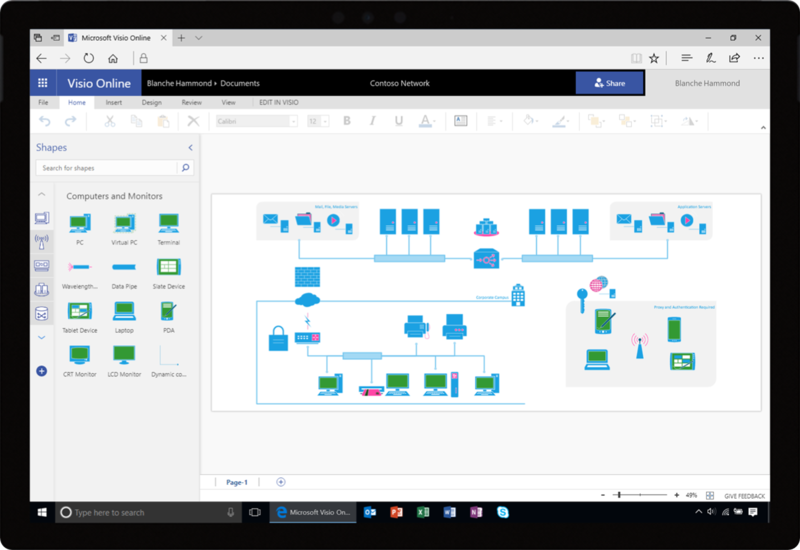 Create advanced network diagrams in Visio Online—Last year, we introduced Visio Online, a web-based version of the popular Microsoft diagramming tool. Starting this month, Visio Online now includes a variety of network topology and equipment shapes, giving administrators the tools to create detailed network diagrams and plan their IT environment. We also introduced new canvas capabilities like Dynamic Glue and Control Points, giving all users greater control over shape customization and making it easier to produce complex diagrams. Visit Visio Online Support to learn more. Visio Online now includes network topology and equipment shapes to create detailed network diagrams. Prepare for GDPR with new compliance capabilities—The European Union’s Global Data Protection Regulation (GDPR) goes into effect May 25, 2018 and sets a new precedent for data protection and compliance. Throughout February, we announced several new capabilities in Microsoft 365 that leverage the cloud to help organizations meet their compliance obligations. Compliance Manager, now generally available, helps you assess and manage your risk and prioritize tasks to achieve organizational compliance. We also introduced new features in Azure Information Protection (AIP), including the general availability of AIP Scanner, which enables you to automatically discover, classify, label, and protect sensitive data in apps, cloud services, platforms, and on-premises. Learn more about these new features in our latest GDPR blog. Changes to Office and Windows servicing and support—As part of our ongoing commitment to help our enterprise customers with the deployment and maintenance of their corporate environments, we announced changes to our servicing and support models. These updates include servicing extensions for Windows 10, changes to the Office 365 ProPlus system requirements, and new details on the next perpetual release of Office and Long-Term Servicing Channel (LTSC) release of Windows. Read more about the details on our TechNet blog. Learn more about what’s new for Office 365 subscribers this month at: Office on Windows desktops | Office for Mac | Office Mobile for Windows | Office for iPhone and iPad | Office on Android. 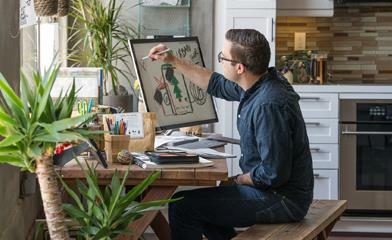 If you’re an Office 365 Home or Personal customer, be sure to sign up for Office Insider to be the first to use the latest and greatest in Office productivity. Commercial customers on both Monthly Channel and Semi-Annual Channel can also get early access to a fully supported build through Targeted Release (Clients, Services). This site explains more about when you can expect to receive the features announced today.